Default member level, who have uploaded profile photo, should get this shiny testing badge. Only members that have profile photo, belong to default level, get this badge. First off, not every pick on our list is indeed a "place," per se. One is actually a scientific phenomenon, while another is considered a massive living organism home to more than 1,500 fish species and nearly 3,000 individual coral reefs. Several are wide-open spaces, but a few are brick-and- mortar sites built for kings (and in one case, a queen). Three have been included on the listing of the Seven Natural Wonders; three were also selected for the listing of the New 7 Wonders of the World. But no matter how you slice and dice them, all 10 have something important in common: Sometimes, it is all about what pleases the eye. Here's our list of the World's Prettiest Places. Our next selection is largely unknown to tourists from the United States, and perhaps that makes it even more precious. The limestone caves of the Plitvice Lakes National Park make the water of its 16 lakes and a handful of waterfalls shimmer brilliant shades of turquoise, silver and green. And to get a better view the lakes' beauty, you'll find a web of wooden plank walkways scattered throughout. But note that there is no true best or worst season to stop by this site in central Croatia. Snow and ice transforms the area into a winter wonderland; in summer the surrounding trees further enhance the hues of the lake water. If at all possible, though, avoid the onslaught of local tourists in July and August. Molded out of red sandstone and white marble, and sparkling with the glint of semi-precious stones, this mausoleum of northeastern India needs no justification to appear on our list. Frommer's says, "It's not just the perfect symmetry, the ethereal luminescence, the wonderful proportions, or the sheer scale," that makes us revere the Taj Mahal. It's also "the exquisite detailing covering every inch of marble that justifies it as a wonder of the world." Its amorous background also feeds our admiration: It was commissioned by a 17th century Mughal emperor to honor the memory of his favorite wife, Mumtaz Mahal. Consider planning a trip for sometime between October and March to behold Taj's majestic domes, chambers and minarets; that way the weather will be somewhat cooler for walking around. 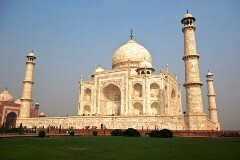 If you have time, stay from the early morning until the late night, as "the radiance of the Taj under the moonlight is beyond any explanation," notes TajMahal.org.uk.